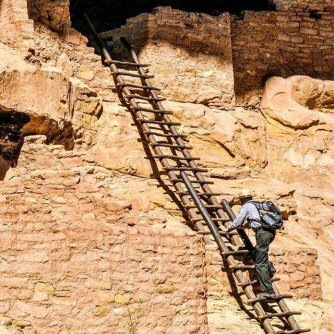 Take a step into the past and learn about the Ancestral Pueblo people who lived at Mesa Verde over 700 years ago. 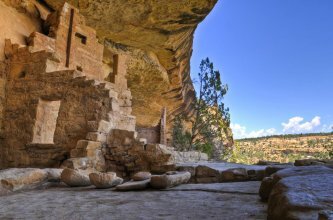 Enjoy cultural information on Mesa Verde cliff dwellings and mesa top sites. Today, the continued preservation of both cultural and natural resources is the focus of the park’s research and resource management staff. Mesa Verde National Park contains nearly 8,500 acres of federally designated wilderness in Southwest Colorado and occupies just over 52,000 acres of the Colorado Plateau. The Park showcases thousands of archaeological sites, distinct wildlife, unique plant life and abundant habitats that support a large number of species. Visible geologic formations within the park date back to about 90 million years ago, and consist largely of sandstones and shales. 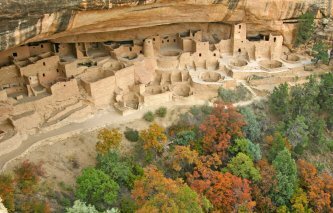 Mesa Verde lies in the transition zone between scrublands and a forested mountainous environment, nestled in the Rocky Mountains. Just a short drive from Durango, Colorado and centrally located in the Four Corners area, Mesa Verde hosts the large, intricate cliff dwellings that inspire visitors to imagine life was like in this area from 500-1200 A.D. Spend your day touring the many sites in the Park or reach out to us to plan a field trip for kids. Although a majority of the park is self-guided, the staff at Mesa Verde National Park offers a 1-½ hour, curriculum-based, ranger-guided tour of sites throughout the year. Hike near ancient dwellings, camp underneath the stars, observe artifacts and geologic formations or spend your weekend observing wildlife and bird watching. The list of activities is endless! For more information about visiting Mesa Verde and for reservations and permits, click here. You can get involved and support Mesa Verde National Park by becoming a park partner, purchasing merchandise from their store, or become a member of either the Mesa Verde Museum Association or Mesa Verde Foundation, participating as an Artist-in-Residence, volunteering your time, or donating directly. All donations and contributions will benefit and expand opportunities for research, ranger-led programs and educational outreach in an effort to make the Park a better place. Find out how you can get involved.